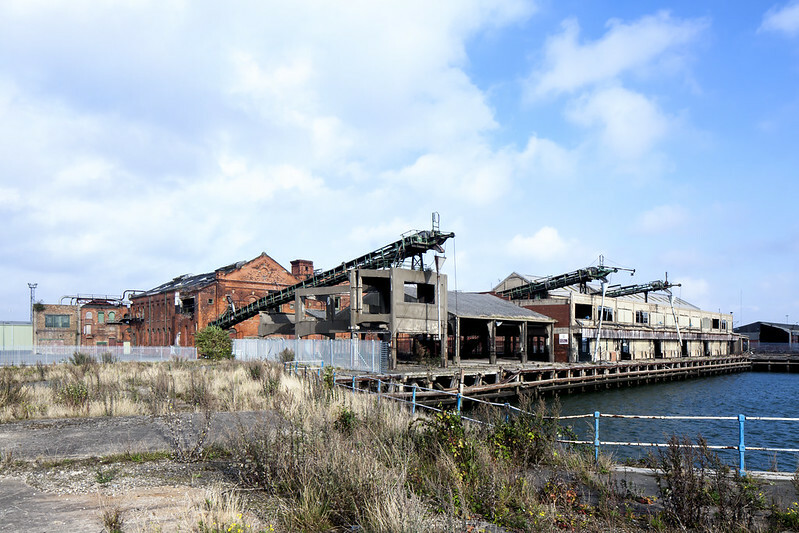 The expert mission to the Grimsby Ice Factory, listed among the 7 Most Endangered heritage sites in Europe in 2018, took place in Grimsby on 16-18 December. The Ice Factory was too unsafe to enter, but the freezing weather was an appropriate indicator of the raison d’être of this ghost of industry. Graham Bell, Board Member of Europa Nostra, and Thomas Hackett and Richard Deeley, Technical Consultants contracted by the European Investment Bank Institute (EIB-I), were hosted by the port manager on behalf of the Associated British Ports (ABP), the owner of the building. The mission report on the building is expected to be published in March. An announcement is expected in the near future about development intentions for the port, within which the Ice Factory, currently a gaunt ghost of past fortunes, will be a landmark gateway. This is not the story of an isolated building but of a facility that once was an integral process of one of Europe’s largest fishing ports. Fishing has declined, but the building is embedded in a port that has found new markets. The future of the Ice Factory is tied to that of the port and so the mission team needed to appreciate the economic as well as the physical environment. ‘Port’ is the term which describes a commercial facility, but it is also used to describe a town heavily dependent upon that commerce, and so the mission experts needed to be mindful of the wider socio-economic dependency of the community upon employment. The nomination of the Ice Factory for the 7 Most Endangered programme 2018 had been made by SAVE Britain’s Heritage, on behalf of, and working with, a dedicated local group, the Great Grimsby Ice Factory Trust (GGIFT). The mission team first met their representatives to hear about the background to the nomination, the relationship between the two organisations and what they believed to be the main factors determining the future of the Ice Factory. 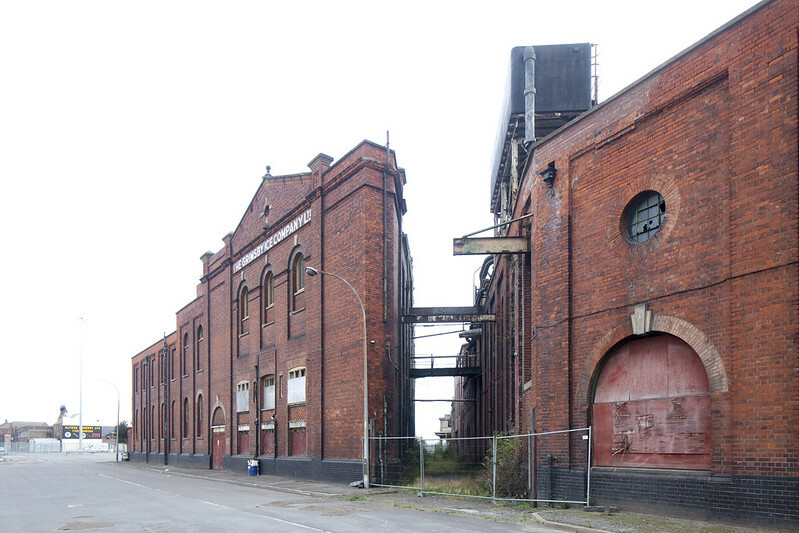 The heritage significance of the factory and its vulnerable condition are both recognised at a UK level. It is a protected building of high national significance – less than 6% of protected buildings in the UK are in this higher category, listed as ‘grade II*’. The Ice Factory has been empty and unused since 1990, so it is also on the Historic England Heritage at Risk register, attracting central government attention and access to some resources in support of a solution that would conserve its special character. It was this combined significance and risk which motivated the nomination by SAVE and the aim of GGIFT to aid its preservation. The Associated British Ports (ABP) briefed the mission team on the issues that had dictated why the Ice Factory had not had any operational value to the commercial port. Much was changing that would improve the prospects for the Ice Factory – the company’s recognition of the role of heritage within its various ports’ assets, central government financial support for investment in the port and town of Grimsby, and as a result, private sector interest in their development potential. The mission team and other organisation representatives were then given a tour by ABP of the commercial port, constructed in the 19th century on a grand scale. The docks remain, but also an intimate area of fish-smoking houses. In 2009 Grimsby Traditional Smoked Fish was awarded a Protected Geographical Indication from the European Union. The fish are mainly sourced from Iceland but only fish smoked in Grimsby using the traditional method can be called Grimsby Traditional Smoked Fish. Hence, this area known as the Kasbah has both intangible and tangible cultural heritage significance: it was designated and given protection as a ‘conservation area’ in 2017. Though this does not include the Ice Factory, it has put heritage preservation within the port on the political agenda locally and nationally.